In May, 2008, Image Publishing released THE NEARLY COMPLETE ESSENTIAL HEMBECK ARCHIVES OMNIBUS, featuring 912 (!) pages of material written and drawn by cartoonist Fred Hembeck (who, in this particular instance of shameless self-promotion, is the actual individual typing in these very words), culled from the past three decades. And all of this fun stuff will cost you (get ready) LESS THAN TWENTY FIVE BUCKS!! So, what exactly do we have to offer you in this massive volume? Well, how about every single Dateline:@#$% strip EVER? That's how this whole thing started out, y'see--my old buddy (and veteran comics embellisher) Al Gordon's suggested I put together a collection of each and every one of those old cartoons, including all the ones that had never been reprinted in a more permanent format previously. Al then proceeded to get his pal--and Image Publisher--Erik Larsen interested in the notion, and once things got rolling along, Erik encouraged me to expand the scope of the book to include a wide variety of additional material as well, some of which had never been seen before and some of which had turned up only in the most obscure of places. Section One: "Little Freddy: Growing Up In The Silver Age of Comics". This is the shortest chapter--12 measly pages--but inasmuch as it best offers an origin story of the tome's main protagonist (again, that'd be me), it seemed like a good jumping off point for any uninitiated readers we manage to rope in. Section Three: This is a hodge podge section bringing together all the Dateline:@#$% strips that failed to make the cut for the Fantaco collections, as well as ones that were done in the mid-eighties following the final Fantaco collection; work for other fanzines such as THE COMIC READER, COMICS SCENE and the like; some early commissions and spot illos, and all of my contributions to the once annual AMAZING HEROES SWIMSUIT SPECIAL (including The Thing in a thong!) --124 pages of art! Section Five: Fifteen strips, ranging from a single page all the way up to ten, mostly--but not entirely--featuring original characters. Old favorites like The Dog and Mr. Mumbo Jumbo share these 80 pages with never before seen epics like 1985's 9 pager, "A Date With History" (a time travel farce) and "Chancy Encounter", a three pager done for a never published charity collection from around the turn of the millennium. Lotsa fun here, you betcha! Section Six: The mid-nineties return of Dateline:@#$%! 210 pages collecting ALL the strips done during that period for THE COMICS BUYERS GUIDE, COMIC BOOK ARTIST, COMIC BOOK PROFILES, a special four pager done for AMAZING HEROES #200, and as many of the quarter page cartoons done especially for the CBG Fan Award winners as I could find! Section Seven: From the nineties to today, another catch all, 64 page collection of goodies: Holiday cards, sketchbook strips, a few pages of KIDZ, several examples of my Classic Cover Redos, commissioned illos, internet art, and even three pages of nature illustration! How then to get yourself a copy of THE HEMBECK OMNIBUS? Well, you can always request that your local comics store order enough to meet demand! And then there's Amazon.com, where the book is already available for pre-order--here's the link. Those of you interested in getting a signed copy will be happy to know that I'll have copies for sale at cover price (plus a yet to be determined Postage and Handling fee), and likewise I'll be offering the option of purchasing a copy including an original, fully-inked, illustration of the character of your choice on an inside page for a fair (but also as yet to be determined) fee--more details as the publication date looms ever closer. Needless to say, I'm pretty darn excited at the prospect of holding a copy of this massive collection in my sweaty little palms, and I'm sure hoping some of you out there are at least mildly thrilled with the idea as well! 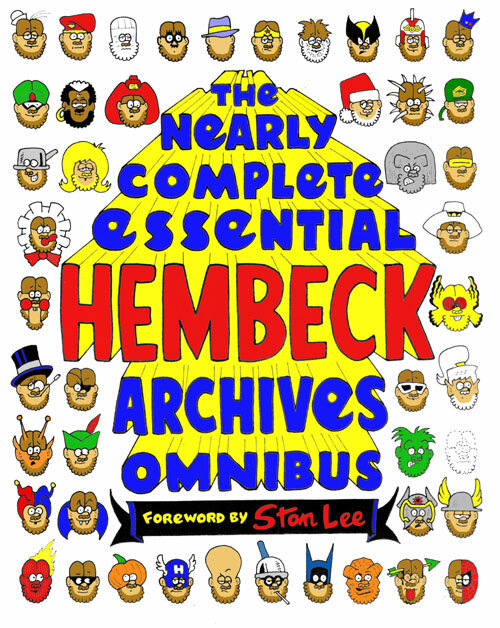 THE NEARLY COMPLETE ESSENTIAL HEMBECK ARCHIVES OMNIBUS--ask for it by name! You can acquire either a copy featuring my signature (and a Fred head, natch) on the opening, blank page of this tome for the (almost) cover price of $25 (plus P&H, but more details regarding that later), or you can have me fill in that self-same space with a fully finished drawing of the character of your choice (yes, even one of your very own creation, as long as you provide reference) for an additional $25 for a total of $50! If you're interested in more than one character, well, we can certainly discuss that and come up with a modified fee that's fair to all--just let me know what you're considering and I'll quote you a price! Media Mail--using my own primitive yet always reliably sturdy packaging methods--with insurance will set you back a mere additional five dollars. Of course, it'll take longer to get to you, but if you're getting a drawing done, it won't be shipped out overnight anyway. If you're overseas? Contact me with your exotic whereabouts and we'll get back to you with the proper postage fee, okay? Fact is, even if you're here in the good ol' U.S. of A., you'll need to contact me regarding payment (we take Paypal, Checks, or Money Orders--no cash, please), not to mention the specifics of your request (should you desire a sketched edition)--email me at fred@hembeck.com, and I'll get back to you in a timely manner (as opposed to a Timely manner--little comics joke there, folks) (very little...). Any questions, ask away! And thanks--yer patronage is always appreciated! !